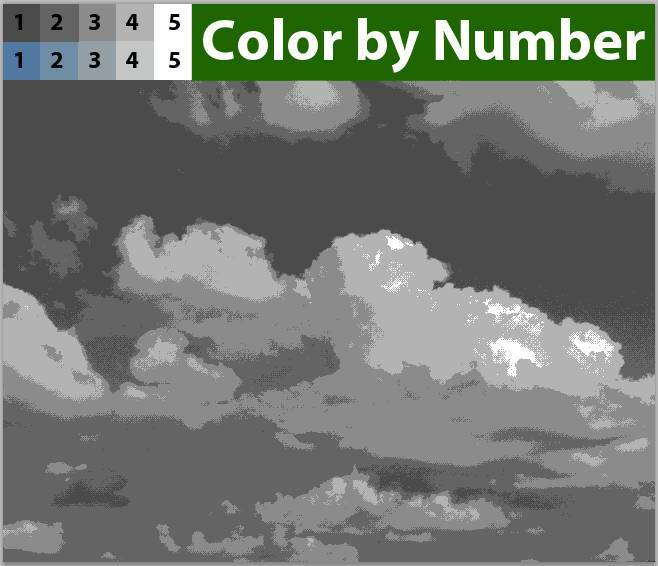 In this Photoshop tutorial we will take a clouds image, and turn it into a Color by Number picture. 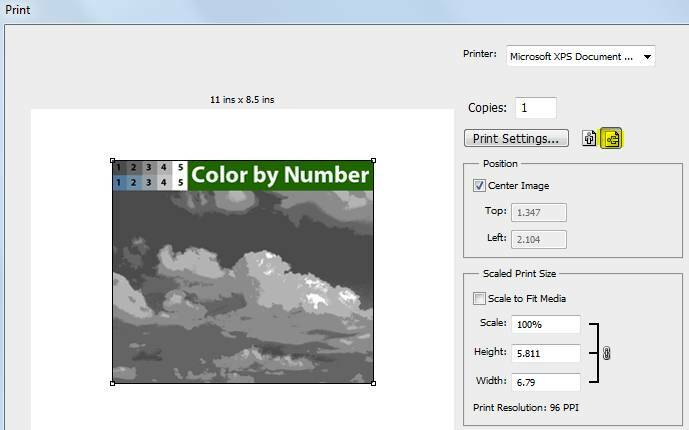 This Color by Number picture can then be printed, colored with any paint, crayons or colored pencils. Print on glossy paper If you decide to use paint. 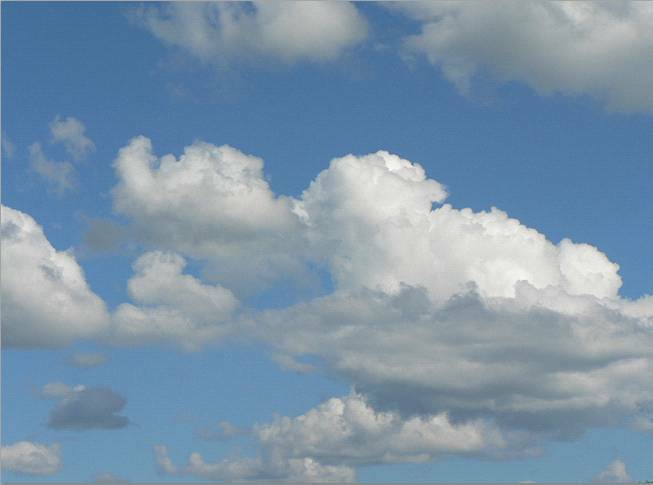 Open the clouds picture in Photoshop. On the menu, go to Image/Mode/Indexed Color. 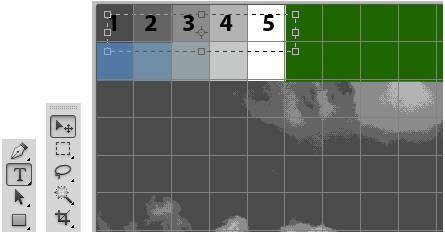 In the dialog box: Palette = Local (Adaptive), Colors = 6. 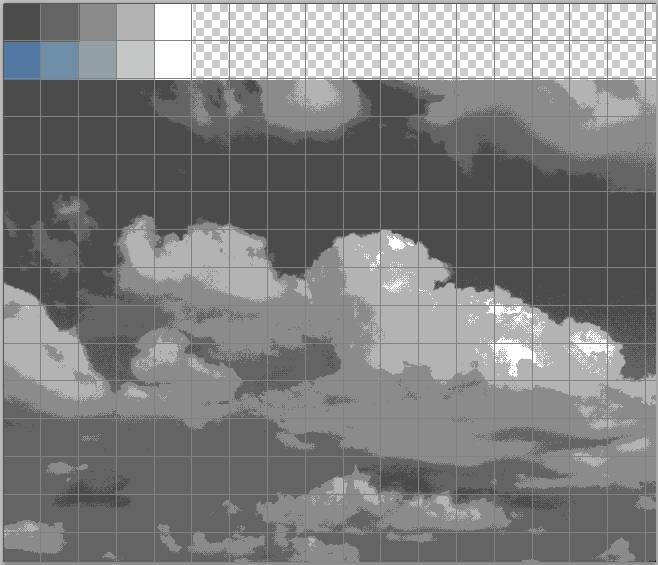 Experiment with the Palette, because there are many modes to try out. Also, experiment with the Colors. Get the lowest number of colors before the image looks too dull. The picture actually has 5 colors. Sometimes we will get one or two colors less than what we chose in the Indexed Color box. Go back and change things back to Image/Mode/RGB Color. 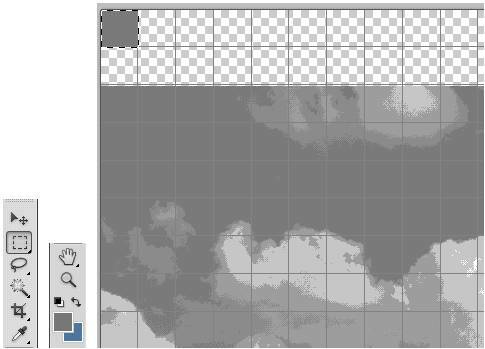 This will allow us to work with layers again. Duplicate the Background layer two times. 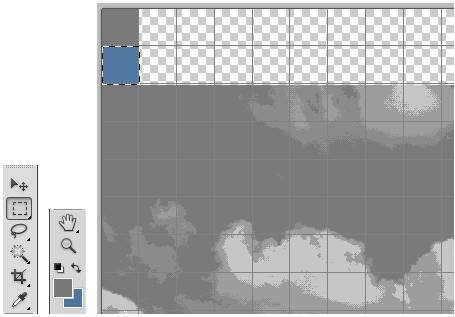 For the first layer, go to the menu and to Image/Adjustments/Desaturate. This makes the Background copy layer black and white. 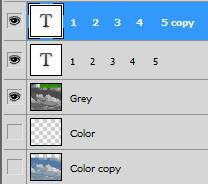 Change the names of the three layers to Grey,Color and Color Copy. The Color layer is in case you make mistakes and have to start from the original 5 color image. Turn on the Color layer. On the menu go to View/Show/Grid. Also check Snap. Go to Image/Canvas Size. Add 2 cm in height. Now we have room to put a numbered color and gray palette. Select the Magic Wand Tool. Put the Tolerance to Zero. UncheckContiguous and Anti-alias. Do this so the Magic Wand Tool will select all the same colors when you click a color from the image. With the Magic Wand click a color area. A selection of all the same colors is created. Next, click the Eyedropper Tool. Click inside the selection to transfer the color to the Foreground. The Foreground is now dark blue. Go back to the Gray layer. 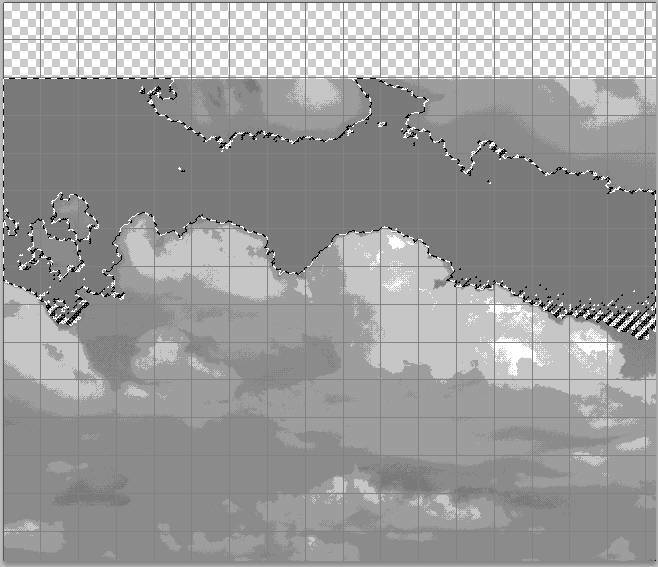 The selection is now on the Gray layer. Switch the blue to the Background. Now with the Eyedropper Tool,click inside the same selection above. The Foreground color is now dark grey. Go back to the Color layer. When you are done, click Delete on your keyboard. We will delete the color to make it easier to select the remaining colors. Go back to the Gray layer. 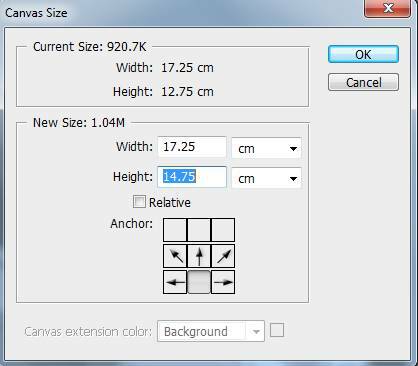 Next, click the Rectangular selection tool and draw a selection in the top left corner. Go to Edit/Fill and choose the Foreground color. It will fill dark gray. 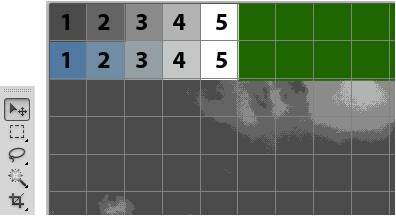 Make another selection below the gray square. 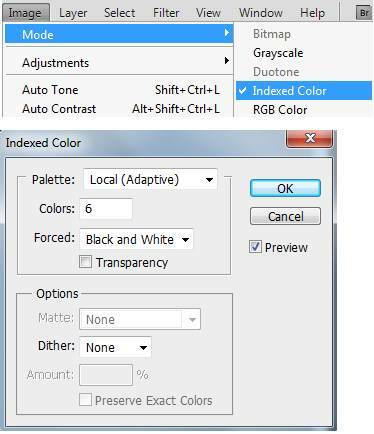 Go to Edit/Fill and choose the Background color. It will fill dark blue. 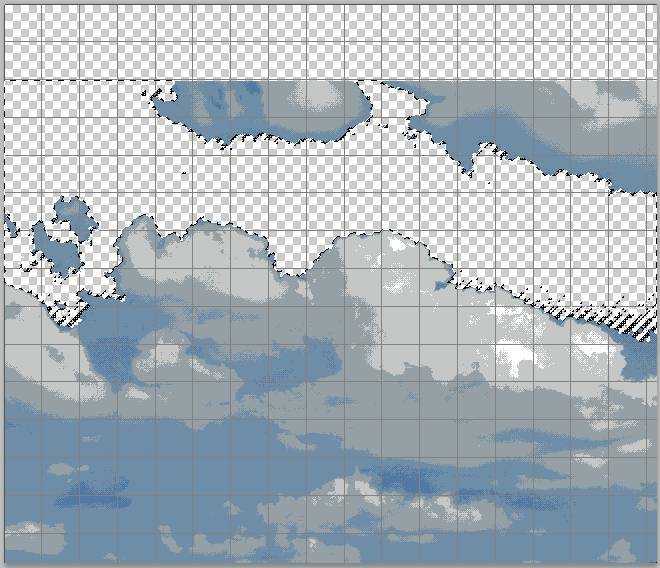 So you now get the idea: every color in the Color layer, represents the shade in the Gray layer. Follow the same steps above and fill the remaining 5 columns as seen below. This is what the layer stack should look like now. 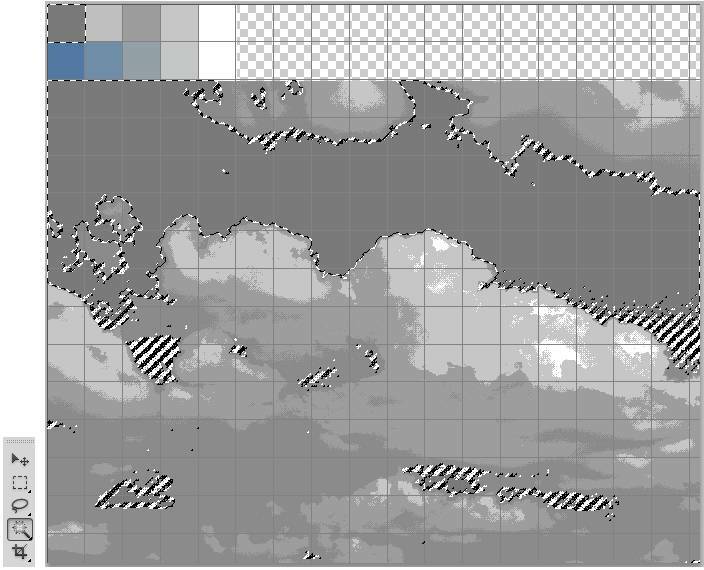 The Color layer is empty because we delete each color selection after each gray/color column is done. The gray scale is uneven, and some gray shades are almost the same. This will make it confusing. So let’s get a nice even gradient for the gray shades. 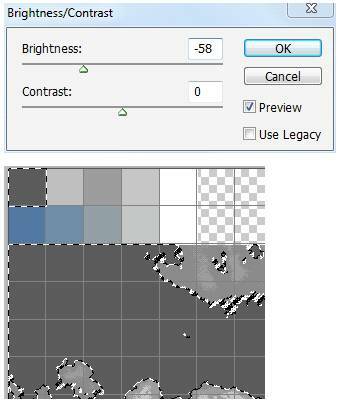 Use the Magic Wand and click the first gray shade. All same colors are selected. On the menu go to Image/Adjustments/Brightness/Contrast. Turn the Brightness down to make the first shade darker. Do the same for any other gray shade until you have a nice even gray gradient above the colors. Now it is easier to see all five gray shades in the image. Change the Foreground color to green. Then go to the Bucket tool and fill in the empty space. 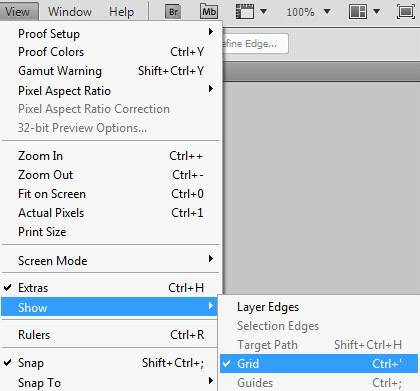 Use the Text Tool to create a text selection over the gray shades. Type in the numbers 1 to 5. Use the Move Tool to center the numbers. This is what the layer stack looks like so far. Center the numbers with the Move tool. Right click the Gray layer and Flatten Image. Turn off the Grid. The final image, ready to print. Go to File/Print. Select Portrait or Landscape. 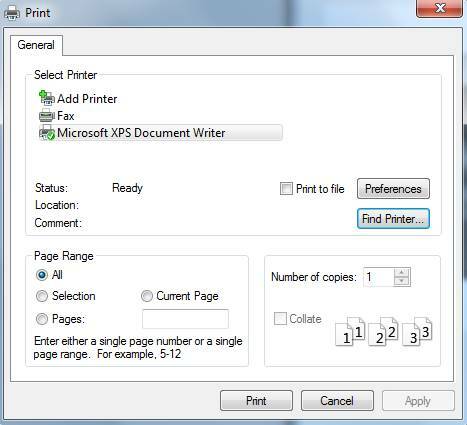 Click Print and make any settings you want for your printer. Remember to use heavy paper or glossy paper if paint is used to color the printed picture.